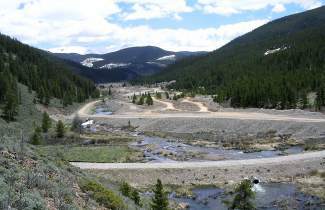 Summit County is in the process of restoring the Swan River, pictured here, to mimic its original state after dredge mining for gold dramatically impacted several of the region's major waterbodies during the 19th century. The first phase of the massive project, including rock-crushing activity near Tiger Road in Breckenridge, is set to get underway after Memorial Day following an unsuccessful appeal Tuesday, May 3, to curtail those milling operations. Summit’s Board of County Commissioners unanimously voted to deny a Breckenridge resident’s appeal during a special hearing on Tuesday afternoon concerning the recent decision to permit rock-crushing activities near Tiger Road as part of the county’s ongoing Swan River Restoration Project. A jam-packed and spirited room met the commissioners at the County Courthouse in Breckenridge for the hearing. Peter Podore, a Summit Estates HOA member and 15-year resident off Tiger Road, filed a complaint with the commissioners following a March 24 Upper Blue Planning Commission meeting approving the permit to allow gravel milling on nearby land co-owned by the county and town of Breckenridge for up to five years. That put into effect an appeal process to present and discover all of the facts with the board making a final ruling. During the five-hour meeting, Podore, representing a large group of distressed citizens — many of who were in attendance — passionately voiced a number of concerns regarding the acceptance of the permit. Complaints ranged from insufficient notification to the threat of increased noise and the increase of truck traffic on Tiger Road. During the public comment period, fellow residents also in opposition to the rock-crushing operation shared worries over potential impacts to their well water source and the road damage rock trucks would create. Members of the public in favor of the project also came forward at this time, including representatives for the Dillon Ranger District, Colorado Trout Unlimited and Breckenridge town council. Podore, in his statements before and after the public comment period, noted he was not opposed to the continued river restoration project, but specifically charged that the permit includes few to no reasonable limitations on the amount of rock crushed nor the number of trucks allowed up and down Tiger Road each day. On top of that, opponents wondered why county documents state the first phase of the restoration project would be near completion by the end of September this year, but the county, meanwhile, is issuing a five-year permit that can be renewed for a total of up to 10 years? Jason Lederer, resource specialist for the county’s Open Space & Trails, took the lead in responding to Podore’s protests. He asserted that the entire Swan restoration project is years in the making and includes any number of partners and endorsers, including the U.S. Forest Service, Colorado Parks and Wildlife, the Colorado Water Conservation Board, among several others. Within an atmosphere of public suspicion and mistrust, he stated the goal of the project — and permitting process — is and remains total transparency. And that without the commercial sale of the rock crushed on site, the county cannot properly offset the approximately half-million-dollar price tag of this first phase of the restoration project. He added that, given his expertise on the subject, it was highly unlikely nearby groundwater sources would be impacted by these milling activities. The standard five-year permit, said Lederer, provides for “flexibility” in avoiding limiting the opportunities at breaking down rock that would need to be removed anyway to perform the restoration process. Road & Bridge director Tom Gosiorowski and assistant county manager Thad Noll, who lives not far from Tiger Road, then confirmed the county would be responsible for any necessary road repairs from so much additional truck traffic on the road. The commissioners affirmed some citizens’ concern that the permit did not include a completed travel management plan, saying a final version would need to be included and agreed that, based on anecdotal evidence, ramped up policing of Tiger Road would be for the public good during crushing and hauling operations, which are set to begin after Memorial Day. Commissioners Dan Gibbs and Thomas Davidson also noted being particularly troubled over the public’s claims of improper notifications of the Swan River Restoration Project and the rock milling operation. They concluded, with Commission Karn Stiegelmeier’s concurrence, that the five-year permit would be upheld but with some added conditions. First, an annual review of the construction operations would be held to monitor the proceeds from the gravel crushing to ensure they are going where they should. Moreover, any future permit renewal for the crusher would have to go through a full evaluation process, and both that and the yearly review would come with them a substantially expanded public notification process. Senior planner Alan Hansen and Open Space & Trails director Brian Lorch, who also lives very close to Tiger Road, spoke prominently on behalf of the restoration project during Tuesday’s meeting as well. Each was adamant that the information being circulated by dissenters during the meeting and in emails to the commissioners leading up to the hearing was inaccurate, and that the resulting project is for the community’s benefit. “The efficient use of public funding and resources is currently being mischaracterized as a profit-making scheme,” said Lorch. “I firmly believe that we can all bear some inconvenience now in order to leave a better place for our grandchildren.